Imagine that one morning you wake up in New York to find that it has snowed all night. The stairway looks like a death trap, but you brave it anyway to find that your car is buried in snow. Or may be you wake up in Kolkata or Mumbai on a monsoon morning to find that your city has transformed into Venice overnight. All the weather channels probably already predicted this and sent you several push notifications, but you decided to ignore it, because either you don’t trust your government or #smartass. Either way you hadn’t prepared for this catastrophe, and now all you have in way of food are eggs, yogurt, and achaari spice. So what do you make? Achari eggs! I understand that you probably wouldn’t normally have achar spice, but remember that all these scenarios are imaginary, or else I would have recommended peanut butter and nutella bread for breakfast, lunch, and dinner. 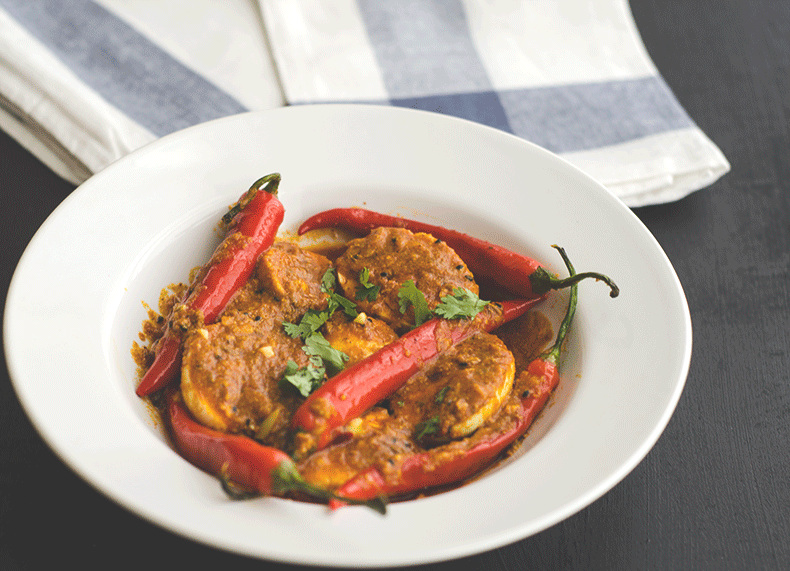 In any case, it wouldn’t hurt to have this achar spice in your pantry all the time, though. But if you are not so lucky as to experience the romance of such extreme climates, and, therefore, are unable to imagine these totally probable scenarios, then I can give you several other more convincing reasons why this is the most convenient recipe ever. The most important being that with this recipe you can feed an army on a dime. 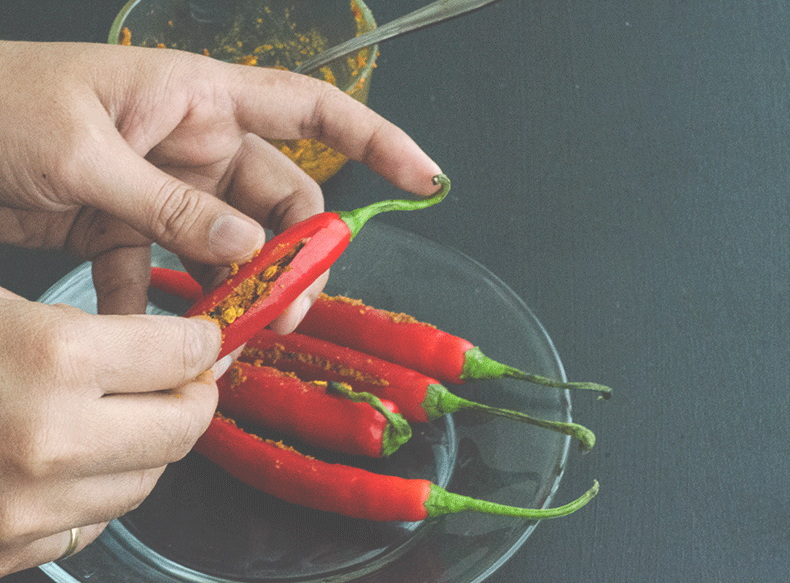 Other than the achar spice you will already have all the ingredients in your kitchen, and the spice is only $1.49 (available at any Indian grocery). Plus, it doesn’t look or taste like an inexpensive dish at all. Secondly, what takes the longest time in this recipe is boiling the eggs. The rest of the process goes like a breeze. Thirdly, if you are someone like me who spends half their time between cities and in airports, then you have experienced the real problem of never having adequately stocked produce drawers. And since this recipe uses ingredients that have a long shelf life, you will never have to stress about family dinners after long flights. 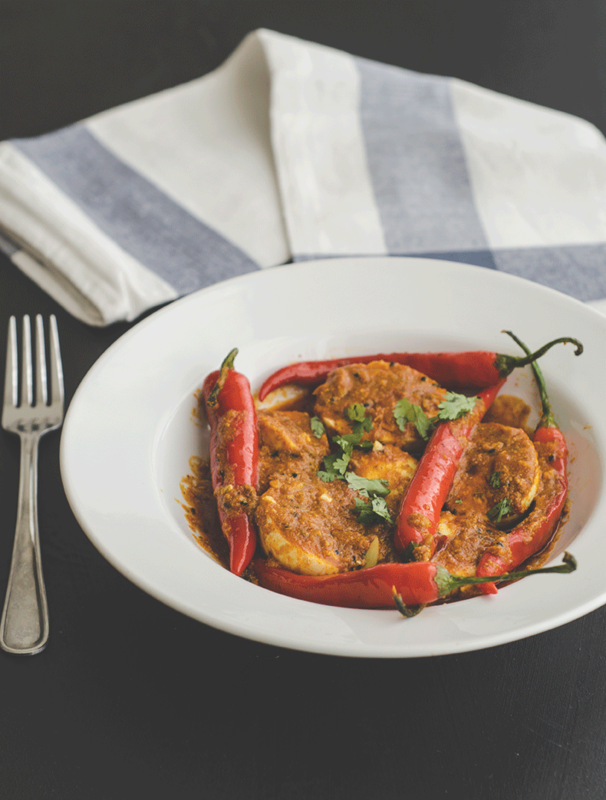 Plus if you are someone who really likes Indian food, but are reluctant to spend a lot of money on spices because you are sure that you won’t use them frequently enough, then this recipe is for you. Warning: This dish is spicy, though. 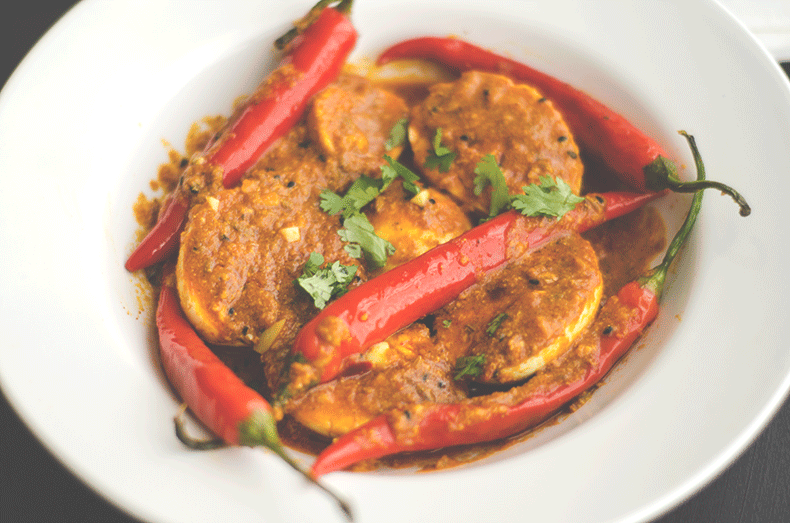 If you don’t like spicy then you may want to skip the chilies and use the achar spice sparingly. In a small bowl mix achar spice and lime juice and stuff the chilies with the mixture. Save the remaining spice stuffing. Heat oil in a pan, add the ginger and garlic paste, tomato paste/puree and cook for a minute. Add the yogurt and simmer for 5-6 minutes over low heat. Add the remaining spice stuffing (if any), the additional 2 tbsp Shaan achar gosht spice , the stuffed red chilies, water, and eggs. Simmer over medium heat for 7-8 minutes, stirring occasionally.